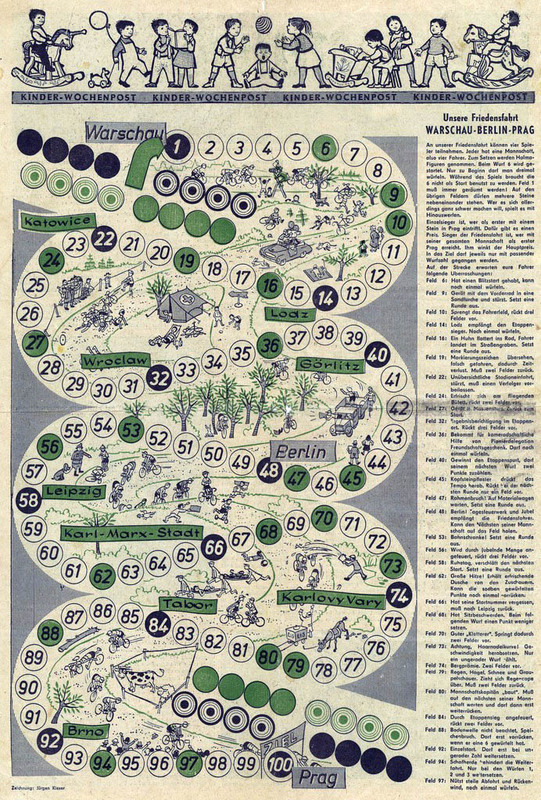 This Friedensfahrt-themed game was published on issue 11/58 of Wochenpost (subtitled: newspaper for politics, culture, economics, entertainment), an Eastern Germany weekly which appeared appeared between 1953 and 1996. According to the wikipedia, its content was a mix of television programming, advertisements, puzzles, politics and culture, aimed at the whole family, and its circulation was of 1.3 million copies. As a rule I try not to buy games torn from magazines, since this may encourage unscrupulous sellers to destroy the original magazines, but I have made an exception on this one because all the copies I have ever seen were torn from the magazine. 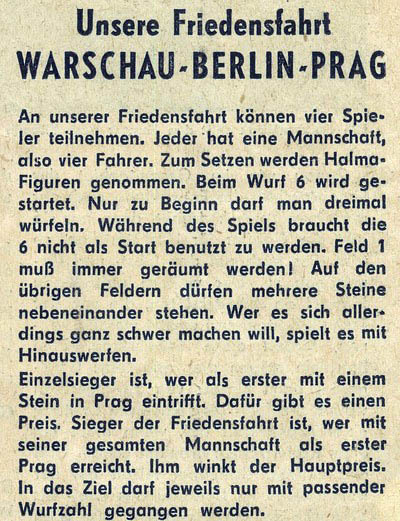 Most probably this game was separed from the magazine as soon as it was issued. At least, that is what it was supposed to happen. The game is newspaper-sized. 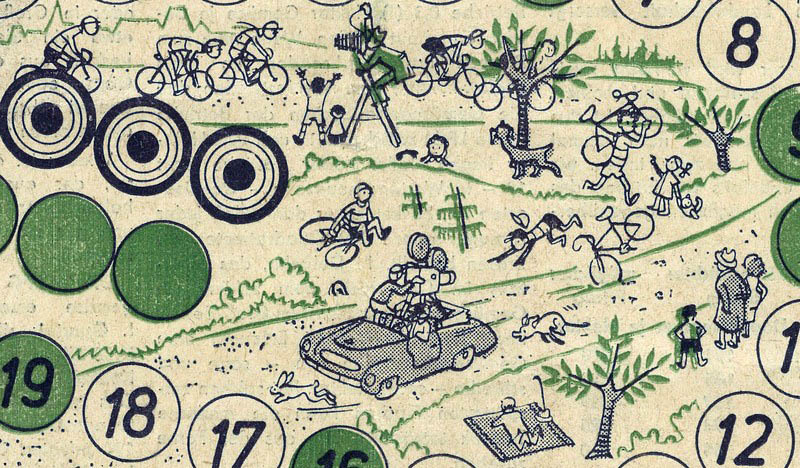 measuring 31 x 47 cms and the board depicts the 12 stages of 1958's race. This game is somewhere in between the roll-and-move games and the simple stage race games categories. Although there are no proper "stage" rules (unless my -poor- German betrays me...), I have decided to include it in the latter (see the reasons below). And after all the Friedensfahrt was a stage race. The illustrations are by Jürgen Kieser, and they are cute, aren't they? 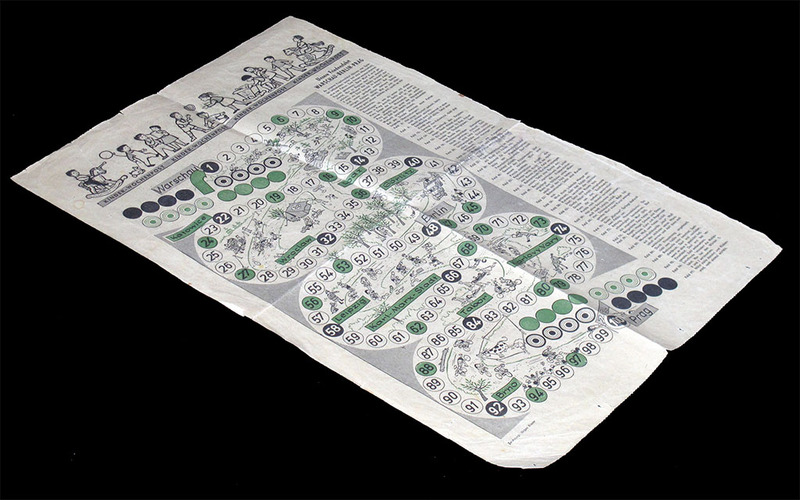 The game is played by four players with a team of four riders each. While there is an individual winner (the first rider to reach Prague), the main prize is the team prize, for the first player to reach Prague with all four riders.. As it is well-known, Eastern-block games tend to favour team competition. The fact that there are four riders per team gives the players a choice to decide which one they should move, in order to reach good fields, to avoid bad ones, and to try not to leave a trailing rider, since the important prize is the team's competition. That is why the game is something more than a roll-and-move game. 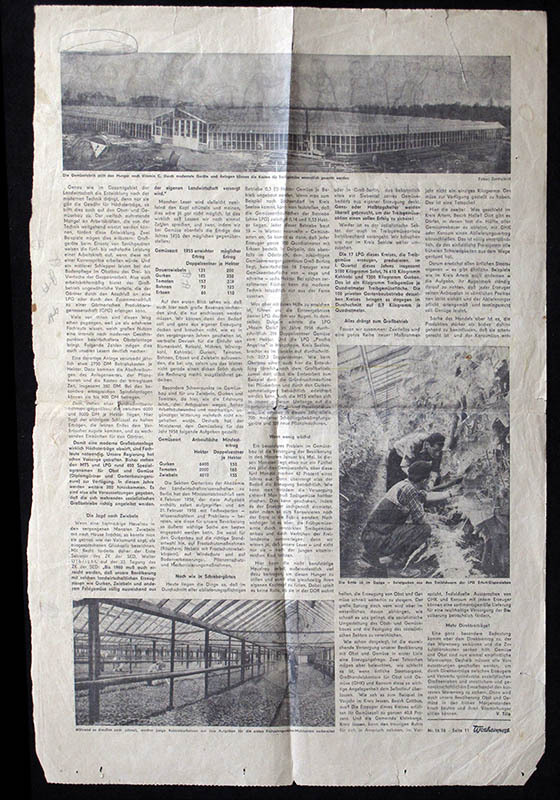 That particular page of the magazine is called "Kinder-Wochenpost". I have seen this game quoted as coming from a magazine called like that, but it is not so. The page on the reverse is not related to the game. Thanks to Gordon for the tip!